The Word of God is alive and active and it is the food of the soul for those who believe in God. 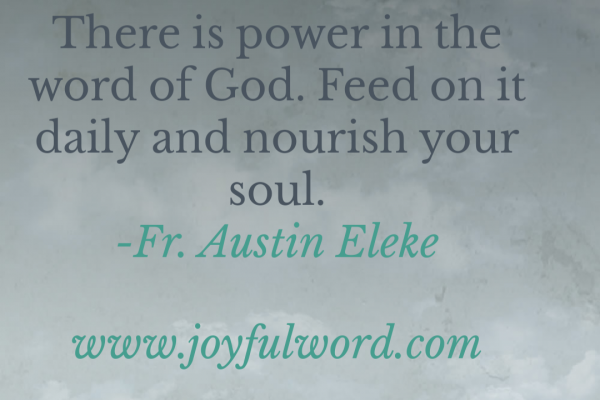 When we feed on the word of God it will nourish our heart and help us to live a life worthy of emulation. Jesus Christ came into the world to show us the way to the Father and He is the Word of God. He called His disciples to follow Him so that they will become carriers of the Word and they will go everywhere to proclaim His Word for the salvation of souls. Levi heard the Word of God and he left everything, including his old sinful life to follow Jesus who is calling Him to a higher responsibility. We must rise like Levi from where we have fallen to accept Jesus' invitation so that we will be saved from the power of sin and death and also become channels of evangelization to the world for the salvation of souls. We must come before the Lord with confidence knowing that He is able to help us in our weakness and in Him we shall find mercy and grace to overcome the challenges of life. The Word of God brings life and it saves. We must let His Word dwell in us and we should proclaim it day and night everywhere we go so that others may find salvation in Christ through the Word we proclaim. Good Morning dearest one. Smileâ˜º and do have a fantastic weekend. May Jesus give you the grace to open your heart so that His Word will dwell in you. Amen. *And May the Almighty God bless you: the Father and the Son and the Holy Spirit. Amen. *Watch-Word:* Your Words O Lord, are Spirit and Life! If you do not feed on the Word of God daily by reading and meditation, you will not be able to live a good Christian life. #Your word is a lamp unto my feet O Lord!